Check Out Our New 10 Line Summer Olympics Scratch Off Cards! 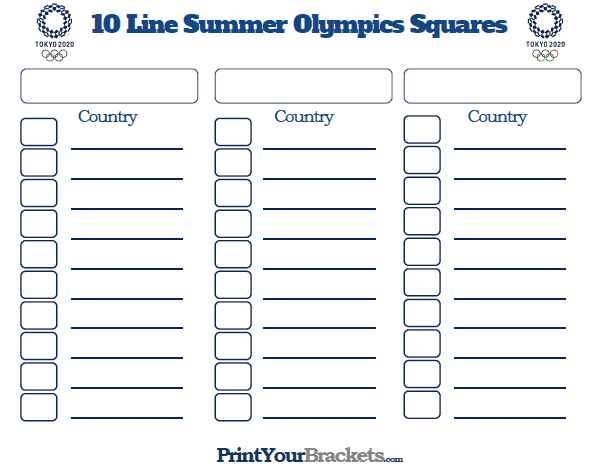 The 10 Line Summer Olympics Squares is another one of our unique office pools, where you will be using the number of medals won by the country of your choice. It is perfect for a small group of people. This pool is similar to our Summer Olympics Squares with 100 boxes. The print-out below gives you the option to run 3 different pools on one page. To run this pool, have the participants write their name on the line or lines of their choice. 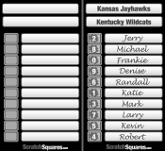 Once the 10 lines are filled up you will randomly draw the numbers 0-9 placing them in the boxes on the grid. Full instructions on running this pool are available at the bottom of this page. Also checkout our Printable Summer Olympics Schedule! Example: The USA wins 48 Gold medals, 30 Silver and 29 Bronze. The total medals won is 107. The person's name beside the number 7(last digit of 107) would be the winner. 2. Another option is to use the sheet from above and have each of the three 10 line cards represent a medal from a single country. So, the green card will represent Gold Medals, the Orange Card Silver and the Blue Card Bronze. Example: We are using the USA for the whole card, and the same example as above: The USA wins 48 Gold medals, 30 Silver and 29 Bronze. You would find the number 8(last digit of 48) on the green card, the number 0(last digit of 30) on the orange card, and the number 9(last digit of 29) on the blue card. The person's name beside each of those numbers is the winner!